Ordering can be done via our webstore, by phone, or by email. A wealth of knowledge and expertise is our key resource for helping you. We are your source for information about Glimakra products. You don’t need part numbers or the correct name. Just a description of what you need and we’ll ask a few questions to assure we understand and send what you need. We can also supply parts for older looms and even some parts for discontinued looms. We keep a large stock of all Glimakra items in our warehouse so your orders can be promptly filled. Helping you get the correct item, whether a stick shuttle, a drawloom or a lost part, is important to us so contact us with your questions by phone 541-246-8679 or by info@glimakrausa.com. Shipping methods and costs generally depend on the size and weight of the items you order. Most shipments are by FedEx Ground, U.S.Post Office. This generally means delivery to your address in less than a week, but for faster deliveries, we can also send priority over night, standard overnight and second day deliveries. 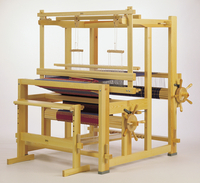 Larger items, that is Ideal and Standard looms, are most often shipped by common carrier (truck), by ODFL. If delivery is to a residence by a common carrier, the residential delivery fee is prepaid. When an item ships motor we send you by email, preferably, a PRO number by which you can track the shipment at odfl.com. Truck shipments take about a week. We take extra time to add additonal packaging on large items to help prevent damage. Books, videos and smaller items are generally shipped to you by priority mail unless you designate otherwise. We can ship looms to Canada. 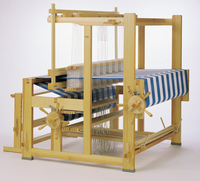 Books, videos, loom parts, drawlooms and looms can be sent worldwide. Small items are sent by international Priority mail and over 15 pounds the FedEx Great Rate program is hard to beat. We will estimate freight or postage before hand if you wish. Shipping charges are based on weight and bulk not on price. Net 30 days. We take checks, which you can send when we email the invoice to you. We can accept credit cards, especially for customers beyond our borders. International customers can also opt for a PayPal invoice. We DO NOT keep credit card information on file. (Wire transfer is also acceptable if needed.) We try to ship orders within 2 business days or sooner. Invoices are enclosed for FedEx shipments and are emailed. A finance charge may be assessed on over due accounts. Notes on receipt of your goods: Always inspect your delivery by FedEx or common carrier for visible damage and to be sure the number of cartons delivered matches what was shipped. (We advise you of the number of cartons before hand for common carrier shipments.) If cartons are smashed, crushed, broken, open, etc. be sure to note this on the delivery receipt. Just write on the receipt somewhere what the problem visually appears to be, eg, “box crushed and open”. After noting visible damage you can inspect the contents for any hidden damage. If there is damage, contact us or whoever you purchased from right away. Without the notation of visible damage on the delivery receipt it is really tough to get any damage claim. For FedEx, be sure to save the cartons and any packing material if there is damage. They may send a driver to pick up the damaged cartons. If you wish to return an item, please contact the outlet/store from which you made the purchase to obtain their authorization/permission. If purchased from us directly, contact us for a RMA, which is a Return Merchandise Authorization. NOTE there is a 15% restock fee and if an item is damaged additional fees may apply. Without a proper RMA, a refund may not be forthcoming. Individual outlets/stores may have their own return policies which differ from ours. Always contact the place where you made the purchase first. We will always try to help you with returns and will do our best to replace items damaged by the shipper.